We are still celebrating International Women's day here at Vitasave.ca because we believe, everyday is ladies day! (Ok, maybe that's the Vitaladies in the office talking) but anyway... Women are special and special people need special nutrients. We have chosen the top 4 dietary must haves that our lovely ladies specifically need to for optimum health. Calcium Bone is a living tissue, constantly renewing itself. Calcium is a mineral that gives strength to your bones and is also necessary for many of your bodily functions, such as blood clotting and nerve and muscle function. During the teenage years (particularly ages 11-15), your bones are developing quickly and are storing calcium so that your skeleton will be strong later in life. Nearly half of all bone is formed during these years. Bones continue to grow in density until our late teens and early 20s. After the age of 35, we naturally lose bone density, making it increasingly important to obtain a good and continuous supply of calcium and vitamin D to keep bones strong. It’s important that you get plenty of calcium in your diet because if the rest of the body doesn’t get the calcium it needs, it will take it from the only source that it has: your bones. This can lead to Osteoporosis, a bone disease that causes bones to become fragile and more likely to break. It develops slowly and is usually caused by a combination of genetics and too little calcium in the diet. How much do you need? 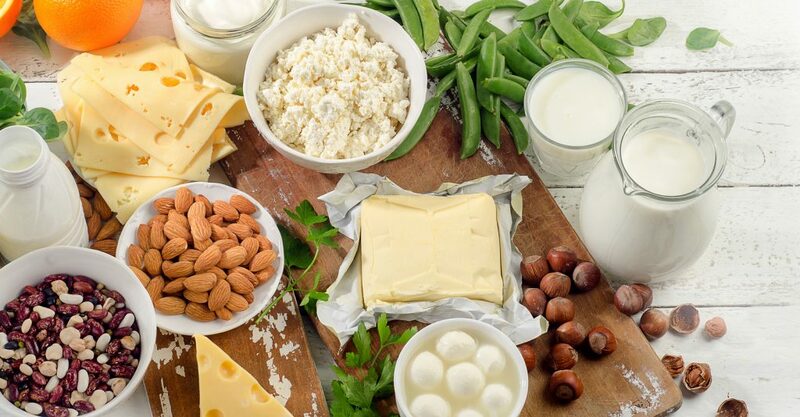 Dairy produce has always been highlighted as the best source of calcium but there are other sources if you maintain a dairy free diet or are lactose intolerant. Adults aged 19 to 50 and pregnant or lactating women are recommended to take 1000mg of calcium per day. Seniors are recommended to take a slightly higher dosage of 1200mg per day. As dairy products are a rich source of calcium, three portions each day should be sufficient to meet an adult’s daily need. After the menopause, the body becomes less efficient at absorbing calcium, so you may need to up your intake. Foods rich in Calcium include: Collards, cooked 125mL (½ cup) - 142mg Spinach, cooked 125mL (½ cup) - 129mg 3.3% homo, 2%, 1%, skim, 250mL (1 cup) - 291-322mg Soy beverage, fortified with calcium 250mL (1 cup) - 321-324mg Almond beverage, enriched 250mL (1 cup) - 312mg Gruyere, swiss, goat, low fat cheddar, mozzarella 50g (1½ oz) - 396-506mg Ricotta cheese 125mL (½ cup) - 269-356mg Yogurt, plain 175g (¾ cup) - 263-275mg Sardines, Atlantic, canned in oil, with bones 75g (2 ½ oz) - 286mg Salmon (pink/humpback, red/sockeye), canned, with bones 75g (2 ½ oz) - 179-212mg Tofu, prepared with calcium sulfate 150g (¾ cup) - 302-525mg Kefir 175g (¾ cup) - 198mg Supplementation Even if you eat a healthy, balanced diet, you may find it difficult to get enough calcium if you: Follow a vegan diet Have lactose intolerance and/or limit dairy intake Consume large amounts of protein or sodium, which can cause your body to excrete more calcium Have osteoporosis Are receiving long-term treatment with corticosteroids Have certain bowel or digestive diseases that decrease your ability to absorb calcium, such as inflammatory bowel disease or celiac disease In these situations, calcium supplements may help you meet your calcium requirements. A common and inexpensive form of calcium supplement, calcium carbonate is an alkaline-based compound found in rocks, limestone, shells of marine animals, pearls, eggshells and snails. It holds one of the highest concentrations of elemental calcium (35-40%), but is not high in bio-availability and requires the production of extra stomach acid to be absorbed. Calcium citrate has an acidic base. This acidity requires less production of natural stomach acids, allowing this type of calcium to be better absorbed than the carbonate form. It does, however, have less elemental calcium concentration (20%) and too, is low in bio-availability. Calcium absorption rate increases with the addition of Vitamin D, so it is worth supplementing the two together. You should however, avoid taking high doses (250mg) of magnesium at the same time as your calcium supplement as they can compete for absorption with one another. Iron Iron is essential for making hemoglobin, the protein in red blood cells that carries oxygen to other cells. It is particularly important during pregnancy and many women need more iron because they start their pregnancy with insufficient stores. The amount of blood in your body increases during pregnancy until you have almost 50 % more blood than usual. This is because your body must supply blood and oxygen to your baby and as a result the demand for iron goes up. Pregnant women need extra iron for their growing baby and placenta, especially in the second and third trimesters. Iron-deficiency during pregnancy has been associated with preterm delivery, low birth weight, and infant mortality. How much do you need? This really depends on your age, gender and overall health. Infants and toddlers need more Iron than adults because their bodies are growing so rapidly. A recommended 10mg per day from ages 4-8 and 8mg daily from ages 9-13 is sufficient. Starting at adolescence, a woman's daily iron needs increase. Women need more iron because they lose blood each month during their menstrual period. Women from ages 19-50 should aim for a recommended 18mg daily, while men of the same age require just 8mg. Pregant women should aim for 27mg per day. During and after menopause, a woman's iron needs reduce as her menstrual cycle comes to an end and she will only need the same 8mg per day as men. Until then, it is important to ensure you get enough iron. Initially there are no sysptoms, but as iron store dwindle, so does your body's ability to produce healthy red blood cells. The result is an iron deficiency, which can be marked by weakness, fatigue and paleness. You can find iron in both animal and plant foods: Animal sources (heme iron) include meat, fish and poultry. Our bodies easily absorb this type of iron. Plant sources (non-heme iron) include dry beans, peas, lentils and some fruits and vegetables. In Canada, grain products like flours, pasta and breakfast cereals are fortified with iron. Our bodies better absorb this type of iron when taken along with meat/chicken/fish or a source of vitamin C like citrus fruits, cantaloupe, strawberries, broccoli, tomatoes and peppers. Supplementation Women with heavy periods and those who don’t eat meat should seriously consider supplementation. Many Iron supplements are available, but some forms such as ferrous sulphate may cause constipation and stomach upsets. Iron is toxic in excess and, although there is little risk of getting too much from food, you should consult a health practitioner before taking iron supplements. Iron is best absorbed when taken on an empty stomach but alongside meals or drinks rich in vitamin C to increase uptake. Unlike some supplements, when the subject is iron, more is definitely not better. Adults shouldn't take any more than 45 mg of iron a day unless they are being treated with iron under close observation. Folic Acid Folic acid or folate (vitamin B9) is essential during pregnancy to prevent neural tube defects such as spina bifida. Because the spinal cord is formed in the first 12 weeks, folate is critical during the very early stages of pregnancy. It can be weeks before you realize you are pregnant, which is why all women of child-bearing age are advised to take a supplement. Folate is also good for the immune system, energy production, preventing anemia and may also help to protect against heart disease and stroke, so it's worth making sure your diet contains enough even if you're not planning a baby. How much do you need? The recommended dose for all women of childbearing age is 400 mcg of folate each day in addition to the 200mcg from their diet (=600mcg) Pregnant women need a total of 700mcg during the first 12 weeks of pregnancy. Dark green vegetables like broccoli and spinach and dried legumes such as chickpeas, beans and lentils are naturally good sources of folate. In Canada, folic acid is added to all white flour, enriched pasta and cornmeal products. Edamame/baby soybeans cooked 125mL (½ cup) - 106-255mg Asparagus, cooked 4 spears - 128-141mg Spinach, cooked 125mL (½ cup) - 121-139mg Lentils, cooked 175mL (¾ cup) - 265mg Peas (chickpeas, black-eyed,, pigeon) cooked 175mL (¾ cup) - 138-263mg Liver (turkey, chicken), cooked 75g (2 ½ oz) - 420-518mg Yeast extract spread (vegemite or marmite) 30mL (2 Tbsp) - 360mg Sunflower seeds, without shell 60mL (¼ cup) - 77-81mg Pasta, egg noodles, enriched, cooked 125mL (½ cup) - 138mg Supplementation Our body doesn’t absorb folic acid as well when it’s in its natural folate form as it does when it’s in a synthetic form. 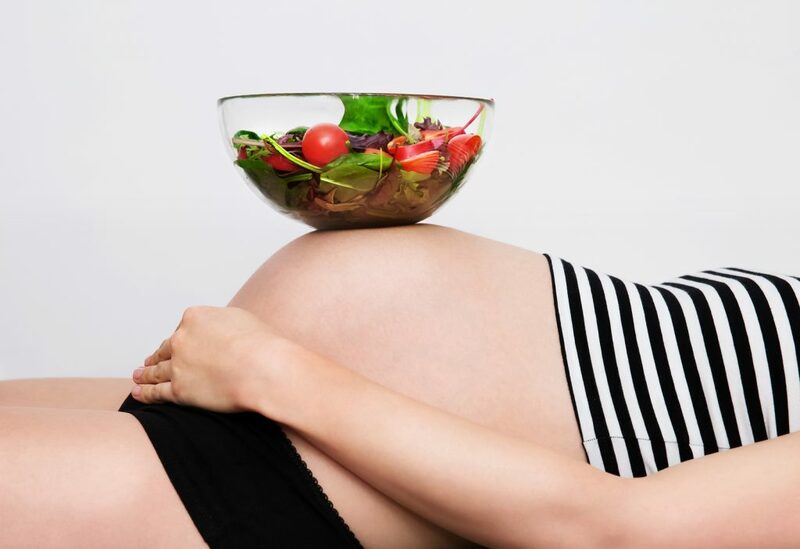 Although it is still good to eat foods rich in folate, it's virtually impossible to get 400mcg from your diet, so a supplement is essential, especially for women who are pregnant or trying to conceive. People suffering from malabsorption diseases (Crohns, coeliac) are susceptible to severe deficiency. When taking individual folic acid supplements, combine it with B12 as folic acid can mask B12 deficiency. Omega 3 There are three kinds of omega-3 fats (EFAs): ALA (alpha-linolenic acid) DHA (docosahexaenoic acid) EPA (eicosapentaenoic acid). Omega 3's are referred to as 'essential' as the body cannot produce them and they must be obtained from the diet. ALA is perhaps the most 'essential' fat as our bodies make EPA and DHA from ALA, but in very limited quantities. Therefore, it is important to include foods rich in DHA and EPA in your diet. The strongest health benefit of omega-3 is related to heart health. This includes helping to maintain a regular heart rhythm, reducing blood pressure, lowering blood fat levels and slowing down the rate at which our arteries get clogged up. Research has actually found a link between increased menstrual pain and low omega-3 blood concentrations. Menstrual cramps (dysmenorrhea) happen when your cell membranes release omega-6 fatty acids, which produce pro-inflammatory eicosanoids. As a result, cramps, headache, nausea, or other symptoms may be present. Studies have found that omega-3, well known for its anti-inflammatory properties, can help to soothe this menstrual pain. Furthermore, Omega-3 fatty acids have been shown to help many of the menopausal symptoms that some women experience. 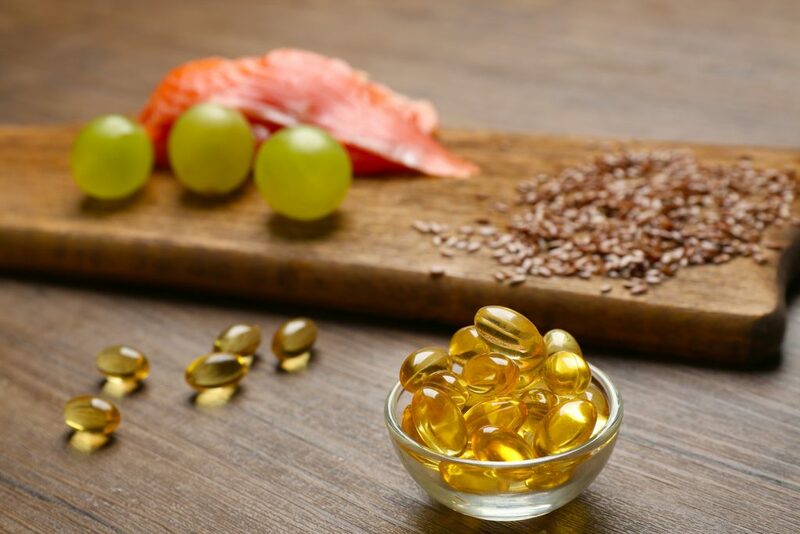 Low blood levels of omega-3s are connected to inflammation, which causes many health issues in menopause, such as osteoporosis, heart disease, vaginal dryness, thinning skin and hair, joint pain, and dry eyes. Oily fish are incredibly rich in one of the most beneficial types of fat: omega-3 fatty acids. Omega-3 fats are vital for the development of a baby's brain, which makes them a key nutrient for pregnant women. Studies also show that women who have a good intake of omega-3 during pregnancy may help to ensure the baby develops a healthy brain and nervous system and possibly reduce the risk of having a premature baby. How much do you need? The amount of omega-3 fat you need depends on your age and gender. Women 19 years of age and older should aim for at least 1.1g of ALA per day, whereas men in the same age group should aim for a little higher at 1.6g per day. Pregnant women 19 and older should aim for 1.4g and those that are breastfeeding should aim for 1.3g. We can get the majority of all the omega-3 oils we need by eating a couple of 140g portions of oily fish each week, which provides about 0.3-0.45 grams of EPA and DHA per day. ALA is found in certain vegetable oils, walnuts, flaxseeds and soy products. For better absorption, choose ground flaxseeds or grind your own because the seed is very hard to digest by the body. Supplementation If you don’t eat fish—the main food source of the omega-3s DHA and EPA—at least two to three times a week, you might consider a supplement (or fortified foods). Fish oil supplements have a certain 'bad side affect' stigma attached and people have experienced fishy burbs, bad breath, heartburn, nausea, loose stools, rash and nosebleeds. There have been huge developments in the wonderful world of omega 3 supplements and many come in a variety of flavours and forms. Taking a high-quality fish oil supplement can reduce the likelihood of any unwanted side effects. It’s also a good idea to take fish oil with meals to reduce side effects. Today there are many vegan friendly omega 3 supplements on the market, mostly derived from the echium plant and algae. These are perfect for those who follow a strict vegan or vegetarian diet, or who simply prefer to stick to a plant based supplement. There are women, especially those over 40, whose lipid profiles show a high ratio of triglycerides to “good” (HDL) cholesterol and as a result, are more at risk for cardiovascular disease. Fish oil supplements are high in omega-3 and offer increased protection for your heart and blood vessels by decreasing your triglyceride levels and increasing your HDL. Taking omega-3 supplementation is a good idea if you’re on conventional hormone replacement therapy (HRT), because HRT can increase triglyceride levels to harmful levels. So there you have it ladies, stay special and stay healthy!